Get over 1,000 exploded gun drawings for use in cleaning & repair projects with this indispensable guide. 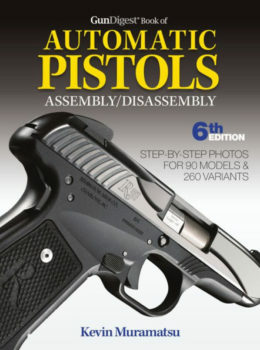 Categories: Exploded Gun Drawings, Gun Digest Publications, Assembly/Disassembly Books, Gunsmithing SKU:: T5656-m Format:Digital Book (PDF), Paperback ISBN: 9781440243493. Identify the parts you need for almost any cleaning or repair project with Gun Digest Book of Exploded Gun Drawings, 3rd Edition by Kevin Muramatsu. 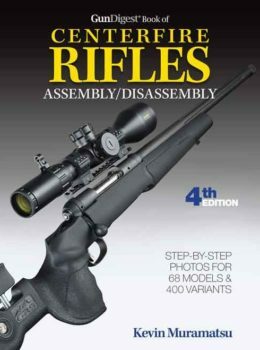 With coverage of over 1,000 models, this indispensable guide is the definitive one-volume resource for collectors, gunsmiths, and hobbyists. This collection of “exploded guns,” or line drawings illustrating each piece of a disassembled firearm, is the ideal aid for anyone wanting to identify and order replacement parts, or take a gun apart for cleaning and simple repair. Over 1,000 drawings of disassembled firearms are provided, with parts identified by number and a key to those numbers. Not only does this guide provide exploded gun drawings, but it also features a resource section containing contact information for buying gun parts and supplies. Kevin Muramatsu is at the forefront of the next generation of firearms writers. With regular columns in Gun Digest the Magazine and several Gun Digest books to his credit, Kevin is known for his original gunsmithing ideas combined with countless thousands of hours of hands-on experience. Kevin lives in the Twin Cities area with his wife, three children and not enough guns.